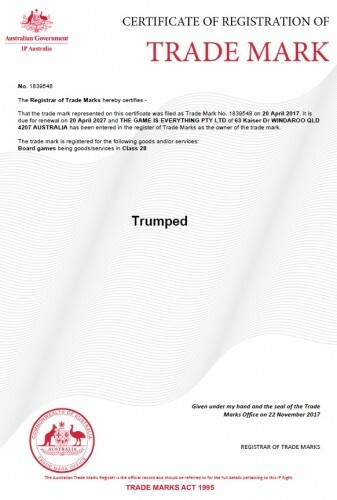 Along with the Trademark assets we are selling we are including our fully developed and tested board game, Trumped. The game is based around players trying to win as many states as they can in a US election. Players move their candidates around a map of the USA taking vacant states by holding “Rallies” or taking states from other players by holding “Debates”. Players also hold a number of #News cards which are randomly picked from the deck and can be played each turn. #News cards enable players to pick up extra states, gain more campaign funds, speed up the election countdown (to end the game faster) or “Fake News” cards which can be used to block another players actions. 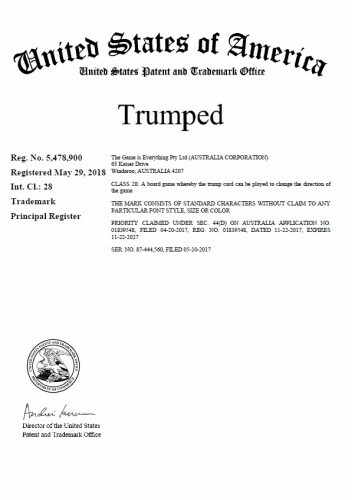 The ultimate card is the “Trump” card which when drawn from the deck causes the candidate who is coming last to jump into first place, causing the other players to get “Trumped”.